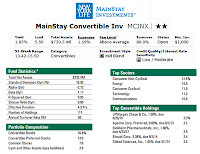 This convertibles mutual fund has total net assets of $710.07 million. The Investor class of this fund was introduced in 2008. Edward Silverstein has managed the fund’s other classes since 2001. Investors may receive 1.85% dividend yield. The most recent yield was distributed in June 2012 ($0.06). The annual expense ratio is 1.19%. The current shares price is $15.05 (9/30/2012). The mutual fund has management fee of 0.25% and front-end sales load fee of 5.5%. The minimum initial investment is $1,000. You can buy the mutual fund from 21 brokerages. They are JP Morgan, Scottrade Load, Ing Financial Advisers – SAS Funds, Raymond James WRAP Eligible, etc. The other classes of this fund are Class A (MCDAX), Class B (MCSVX), Class C (MCCVX) and Class Institutional (MCNVX). 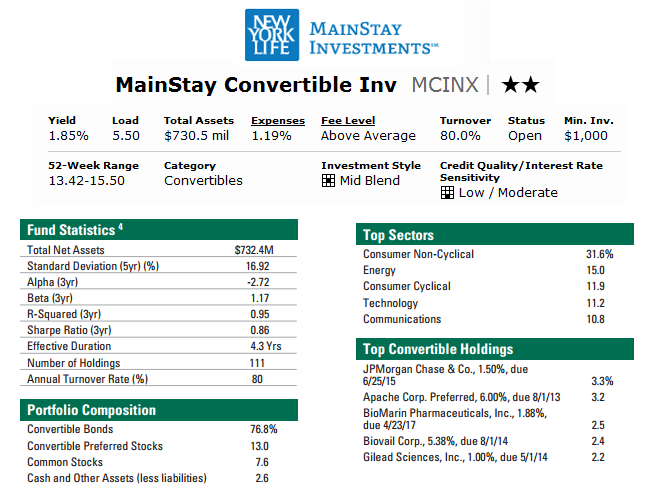 The top 5 convertible holdings as of June 2012 are JP Morgan Chase & Co (3.3%), Apache Corp Preferred (3.2%), Bio Marin Pharmaceuticals Inc (2.5%), Biovail Corp (2.4%) and Gilead Sciences Inc (2.2%). The top sectors are Consumer Non-Cyclical (31.6%), Energy (15.0%), Consumer Cyclical (11.9%), Technology (11.2%) and Communications (10.8%). According to the fund website, the investment risks are market risk, convertible securities risk, synthetic convertible securities risk, debt securities risk, high-yield securities risk, equity securities risk, and foreign securities risk.